ENVY Pool Products was established in 2008. Our company mission is to transform the way residential and commercial swimming pools are utilized by providing unique and quality products for the entertainment minded pool owner. We have become the recognized name in the swimming pool industry and are the premier swimming pool furniture provider in the world. A fully contained sand reservoir inside the pool stool anchors the stool to the bottom of the pool. What are the dimensions of The Pool Stool? How does the pool stool stay on the bottom of the pool? Can I use The Pool Stool on a vinyl liner pool? Yes, The Pool Stool was developed for vinyl liner pools. Is the Pool Stool easy to move around? Yes, even kids can move them. The Pool Stool was designed for easy removal leaving total pool capacity for other swimming activities. Do the Black Granite and Sandstone Pool Stools have LEDs? No, they are a solid color and were developed to match decorative pool finishes. What colors does the LED come in? When the LED is set on the auto mode it works like a color wheel with unlimited colors. You can also pause the LED on your choice of color to set it. You can also use the flash or pick a color. I bought The Pool Stool and can’t locate the LED. What should I do? My remote control does not work inside the pool. What should I do? How much sand do I put in the bottle weight? My Pool Stool is moving around the pool. What should I do? Please ensure the entire bottle weight is completely filled with sand. Strike the weight against the concrete to displace all air. When the bottle weight is filled properly it stays securely in place. My LED is not working outside of the pool. What should I do? Charge the unit for 24 hours. If the light on the bottom of the unit is green then you need a replacement remote. My LED with not charge, what do I do? Nicole, the Pool Stools are a hit, perfect for our situation. We would like to order (4) more beige granite stools, Do you think it would be possible to have them by the end of this week, may be asking too much, thought I would ask. 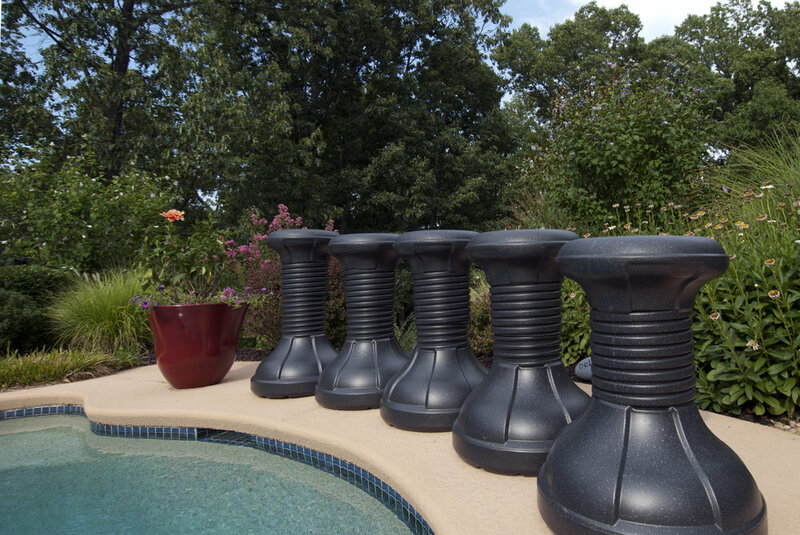 Nicole, Thank you for getting our order for Pool Stools out so quickly. We received them in time for our annual 4th of July Pool Party. Everyone loves them and if you want to know how durable they are, this is the pool to put them in. The kids have put them to the test. They have been taken apart, put back together, sat on, moved from the shallow end to the deep end and back, and in between we adults have enjoyed using them. They are a great product!! I bought 4 of these stools and LOVE them!! Just the right size for my pool and very comfortable to sit on. It reminds me of the swim up bar at the resort in Turks and Caicos. The Pool Stools are so easy to move around the pool too. I am going to order 2 more. OMG!! The Pool Stools are the absolute best thing I have ever added to my pool. The design is genius as are the LEDs. My husband is 6’3” tall and I am 5’4” tall so having them adjust by simply twisting in the water is a great feature. I can’t wait for the table. A real quality product.